In Nairobi, urban expansion and subsequent loss of greenspace was evident, particularly to the north, east and west. Deforestation was identified through the classification, in areas corresponding to local deforestation prevention campaigns. This led to an overall increase of 22% in urban areas and corresponding loss of greenspace. Figure 2: Supervised classifications of Nairobi in a) 1988, b) 2002 and c) 2016, performed using the Random Forest classifier. Comparisons between the two cities showed strong differences between spatial and temporal patterns of urban growth and loss of greenspace. In London, LULCC occurred primarily through densification of existing urban areas and development of inner-city brownfield sites. The rate of urban growth in London decreased notably in the latter half of the period, following introduction of tighter planning policies in the year 2000. In Nairobi however, both densification and urban expansion occurred throughout the period. 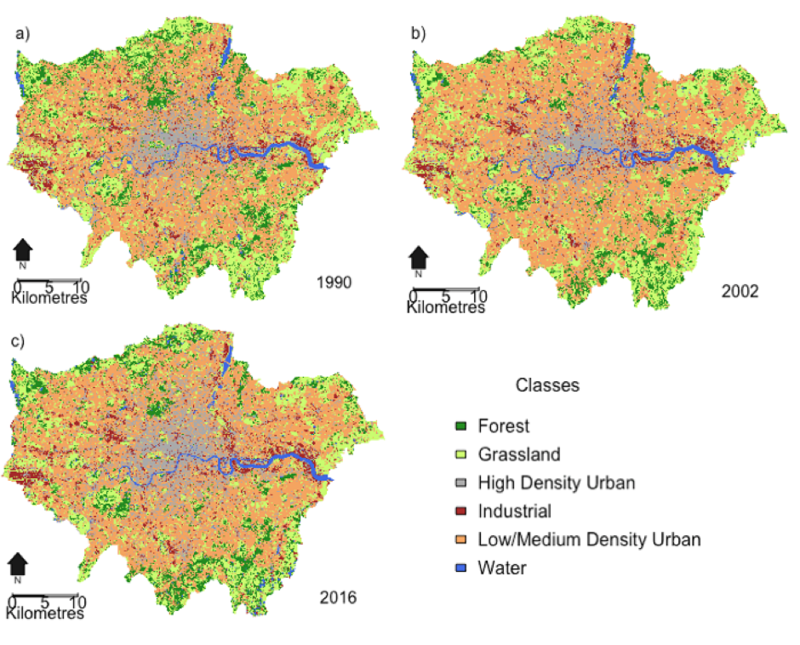 Rates of urban growth and loss of greenspace did drop in the latter half of the period but still remained high, with the latter correlating with population increase (R=0.83). These differences were attributed to planning policies in each city. In London, urban expansion and development was tightly controlled, with an enforced Green Belt and active pursuit of densification through the London Plan. In contrast, there has been no master development plan in Nairobi since 1948 despite rapid population growth and much of the urban expansion in Nairobi has manifested in informal housing areas and slums with little public services provisions. These areas are particularly vulnerable to the effects of climate change, particularly flooding, as was seen in devastating floods during 2016. Comparisons with recent greenspace estimates of both cities suggested this study had under-estimated greenspace in London by around 14% (GiGL, 2015). 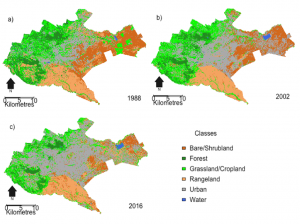 This figure corresponded with GiGL’s (2015) estimated contribution from private gardens and was thus attributed to limited spatial resolution of the Landsat imagery. 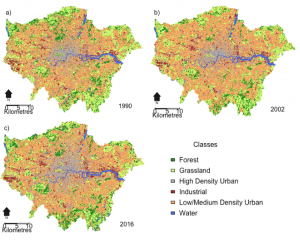 This highlighted the importance of high resolution imagery for LULCC studies and studies into greenspace in urban areas, which are highly heterogeneous. This entry was posted in Earth Observation, Landsat, Urban by Maha Mirza. Bookmark the permalink.